Jon Eddy, the director of marketing and promotions for Sky Sox baseball, emcees the 2nd Annual Achieve with us. Colorado Film Festival. The event was hosted by The Arc of the Pikes Peak Region and The Arc of Colorado to help raise awareness of intellectual and/or developmental disabilities. In honor of National Developmental Disability Awareness Month, the Colorado Springs Sky Sox continued their support of local charitable organizations last week. 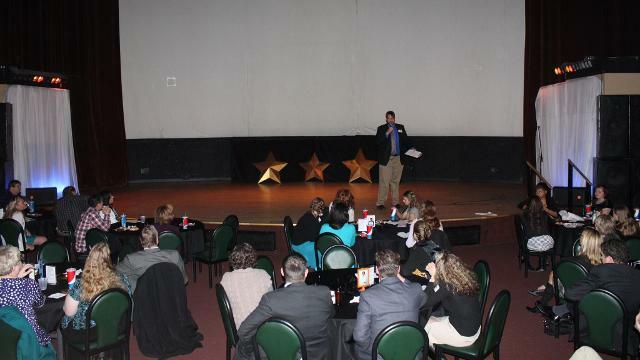 At the Stargazers Theatre, Sky Sox Director of Marketing and Promotions Jon Eddy emceed the 2nd Annual Achieve with us. Colorado Film Festival hosted by The Arc of Pikes Peak Region and The Arc of Colorado. The festival featured 15 short films written by, starring or produced by people with intellectual and/or developmental disabilities from the state of Colorado, as well as the entire United States. Eddy, who has emceed the event both years, has a personal connection to supporting people with intellectual and/or developmental disabilities and is extremely supportive of the cause. "My sister has a disability on the Autism spectrum, Aspergers (syndrome), so this is something I really care about," Eddy said. "This whole film fest is geared around showing these people can be, and are, astounding in some ways that you and I aren't. It's overwhelming." Eddy's sister is currently a teacher of young children in a suburb of New York and found a way to make her disadvantage an advantage by being able to connect so well with children of younger ages. "The idea (of the festival) is to help educate the community about intellectual and developmental disabilities and to celebrate their achievements," said Christina Butero, guardianship director of The ARC of Pikes Peak Region. "Our partnership with Sky Sox stems from the ARC Thrift (Stores) and Jon just became a champion of what we've been doing because of his sister, and he knows how difficult it is to be accepted in our society." Butero said ARC tries to partner with lots of different organizations to help try and build awareness and help create jobs for people with disabilities. During the festival, Eddy enjoyed all the films, but particularly enjoyed "Pretty Girls" and "Aaron 'Wheelz' Fotheringham - The Story". "Pretty Girls" is a short film by 14-year-old Jack Williams and is shot like all his films - with his phone. Jack was functionally nonverbal until he was nine years old when he started shooting videos which have helped him capture the world from his point of view. His films have gone on to win numerous of local and national awards. "Aaron 'Wheelz' Fotheringham - The Story" is about Aaron Fotheringham, a wheelchair motocross athlete from Las Vegas. He was born with Spina Bifida and has no usage of his legs. Spina Bifida is a birth defect of the spinal cord. Fotheringham has been doing extreme tricks the past several years and has traveled with the Nitro Circus led by world-famous motorsports performer Travis Pastrana. Included in the festival is a movement that has made national news in the past few years, which is to stop saying the R-word - 'retard(ed).' Since the word is offensive and derogatory to people with intellectual and/or developmental disabilities, the festival gave attendees an opportunity to pledge against the word. Jack and Aaron are just two of many examples of people with disabilities succeeding despite their "disadvantages," and continue to inspire people all over the country and world. "It was an emotional night for all involved," Eddy said. "I'm overwhelmed by the work that The Arc is doing in Colorado, and proud of the continued partnership between The Arc and The Sky Sox."